LARAMIE, WY--(Marketwire - February 4, 2010) - IDES Inc., the leading search engine and informational resource for plastic materials, now provides their Prospector database of plastic material datasheets in five languages including German, Spanish, French, Chinese and English. "Over the past few years, we've realized a tremendous growth in the number of plastics professionals from Asia and Europe that rely on Prospector to access material datasheets," said Mike Kmetz, president of IDES. "To help our customers more effectively select plastic materials and reference technical information about polymers, our datasheet services are now available in their native languages." There are more than 300,000 people subscribed to the IDES Prospector search engine; 50% are from North America, approximately 25% are from Europe and 25% from Asia. Last year, they accessed 3.2 million datasheets averaging 265,000 datasheets per month, a 33% increase over 2008. Mr. Kmetz added, "We've been able to leverage translations of our database to the plastics information management services we provide for resin manufacturers and distributors which allows them to display the technical data about their materials on their website in various languages." Additional languages are expected to become available throughout 2010. IDES is a plastic materials information management company. The Plastics Web® from IDES is a website with a vertical search engine connecting tens of thousands of companies around the globe with plastics content and technical datasheets from 700 global resin manufacturers. The company provides custom information management services for nearly all resin distributors and a number of resin manufacturers. IDES is headquartered in Laramie, Wyoming, with offices in Europe. For more information, visit www.ides.com. 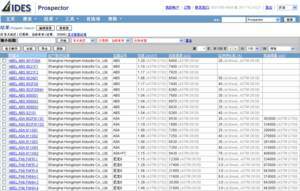 About this company IDES Inc.
Prospector Plastics Search Engine in Chinese.